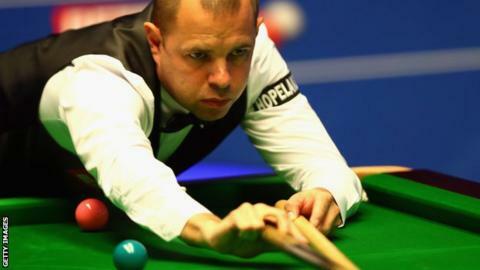 Barry Hawkins was at his familiar World Championship best to go 11-5 up against tournament favourite Ding Junhui in a surprisingly one-sided quarter-final. Hawkins, a semi-finalist in Sheffield in three of the past four years, led 5-3 thanks to four first-session half-centuries. The world number six added three more 50s after the resumption to go 8-3 up. He then won three of the next five, ending with a century, to move within two frames of a stunning win. China's world number three Ding, 31, was the bookmakers' tip to secure a first world title following early exits for reigning champion Mark Selby and world number two Ronnie O'Sullivan - as well as his stunning 13-4 thrashing of Anthony McGill in round two. But the 2016 runner-up was way off that standard in the first 11 frames, wasting numerous chances as he slipped 8-3 behind. A confidence-building 102 - the first century in the match - got Ding back on track and he backed it up with a frame-winning 52. But Hawkins, 39, remained consistently impressive, taking his match tally of 50-plus breaks to eight and rounding off a majestic performance with a brilliant 113 clearance for a commanding lead heading into Wednesday's third and final session from 10:00 BST. In a repeat of January's Masters final, England's Kyren Wilson put on a ruthless attacking performance to lead Mark Allen 11-5 after their second session. Wilson, the world number nine, won seven of the eight frames in the evening session, playing high-risk snooker and putting the Northern Irishman under pressure with some relentless potting. The 26-year-old rattled off breaks of 125, 105, a 92, two 90s and three further half-centuries and needs just two frames to progress when the match resumes on Wednesday at 14:30. World number 16 Allen had taken the final frame of a high-quality morning's play to tie the scores at 4-4. But his form dipped and Wilson's brave shot selection paid dividends, unlike in the Masters final where his radar failed him and Allen's composure saw him win a first 'Triple Crown' event. World number four Judd Trump showed his potting power and battling qualities to take a 5-3 lead over Scotland's John Higgins in the first session of their World Championship quarter-final. Trump took the opening frame against the 30-time ranking event winner. Higgins levelled, but runs of 58, 100 and 71 saw the Bristolian take control. World number five Higgins hit back to win the next two despite being far from his best, but a fine 77 break earned Trump a two-frame advantage. Four-times winner Higgins, 42, had an extra day off after his 13-1 thrashing of Trump's good friend Jack Lisowski in round two. But he struggled to match his performance in a repeat of the 2011 final, with Trump outscoring his opponent, potting more balls and also having greater safety success. Trump, 28, pinched a pivotal third frame by two points after Higgins broke down on 57. The Scot responded to get to within a frame at 4-3, but he missed a relatively simple red which allowed Trump to get the lead his play had merited. Two-time runner-up Ali Carter, who won a feisty round-two match with O'Sullivan, is level with two-time champion Mark Williams at 4-4. World number seven Williams, 43, opened with a magnificent 135 and looked set to go 2-0 ahead after a break of 60. But Carter, 38, pinched the frame with a 63 and led 2-1 thanks to a stunning 126 before both players had two-frame runs in a topsy-turvy encounter. Williams regained the lead at 3-2, world number 15 Carter then edged 4-3 to the good but Williams had the last say in a high-quality session featuring two centuries and five breaks of more than 50.